Menstruation Isn't Optional. So Why Are Menstrual Products Taxed? Although the GST reduced the tax burden on sanitary napkins, there is a need to consider why such a tax exists for what is a necessary good for many. Despite the existence of a Gender Budgeting Cell and notification by the former Planning Commission calling for the adoption of gender-responsive budgeting back in in 2010, sanitary pads and women’s hygiene products continued to be taxed 14% under the VAT regime. The release of GST slabs, which although reduces the tax burden on menstruating ciswomen and transmen who purchase sanitary napkins from 14% to 12%, has brought to the front the additional financial burden faced by menstruating persons just for being born female. As a response, #LahuKaLagaan has been trending on social media, questioning why the government has placed a tax burden on a product that, for many people, can be classified as a necessary good. Indians are not alone in this regard – people in economically developed countries such as the UK and the US have long been asking their representatives to remove the ‘Tampon Tax’. Interestingly, several economically backwards countries such as Jamaica, Nicaragua, Nigeria, Tanzania and Kenya have already taken cognisance of this issue and made sanitary products VAT free. At the other end of the spectrum, Hungary subjects sanitary products to the standard rate of 27%. A particular narrative that has cropped up is that the government sees marital signifiers as essential goods not to be taxed, but has little regard to issues that affect women’s health. However, the government merely adopted the current tax bracket on an as-is basis for the GST. Furthermore, entities manufacturing sindur and bangles would more likely be micro, small and medium enterprises and cottage industries, which would barely cross the tax threshold. The current compliance regime for GST would make it difficult for such small-scale industries to operate and the cost of follow up by the tax department may far exceed the revenue gained. These articles may also fall into certain handicrafts brackets which are exempted as a means to promote the industry. Perhaps the situation does benefit some patriarchal agenda, but this seems to be by happenstance and not by design. Therefore, it is better not to follow that line of argument. When Assam MP Sushmita Dev met with finance minister Arun Jaitley in May petitioning that the tax on sanitary pads be removed, she said that “while he was not at all averse to it and said he would do all he could from his side” his major concern was the loss the exchequer would incur if the tax were abolished. Union health minister J.P. Nadda was also reportedly onboard with the idea and was willing to recommend that tax exemptions be implemented for sanitary towels. Using a quick back of hand calculation, we can calculate the tax revenue that is earned from the sale of sanitary napkins in India. 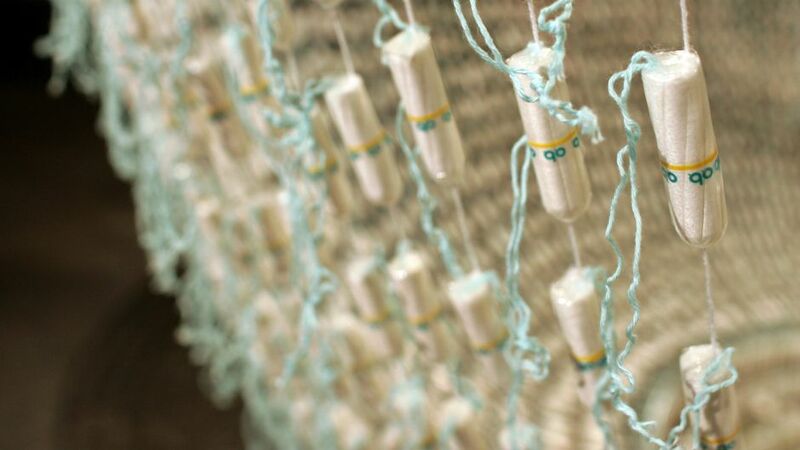 Euromonitor puts commercial sales of commercial menstrual hygiene management (MHM) products in 2014 at 390 crore units worth Rs 1,960 crore with a growth rate of 15% over the previous year. Assuming a similar year-over-year growth, projected sales come up to Rs 2,980 crore for the year 2017-18. Therefore, with GST at 12%, sales of sanitary products would earn the exchequer around Rs 350-400 crore in tax revenue. For reference, demands for grants of flagship projects under the Ministry of Women and Child Development are as follows: National Mission for Empowerment of Women – Rs 70 crore; Beti Bachao Beti Padhao – Rs 200 crore; Nirbhaya Fund – Rs 500 crore; and Support to Training and Employment Programme – Rs 40 crore. Treatment of mensuration as a taboo subject and the lack of first-hand understanding of the experience of menstruation by most policy makers means that it has not received the requisite importance it deserves when it comes to framing policy. This is especially worrying, as lack of information regarding how frequently one should change sanitary napkins and what is the proper method to dispose of them leads to more instances of bacterial infections. Furthermore, sanitary napkins are a huge polluter as disposable napkins have plastic components that do not break down. Pushing sanitary napkins as a sign of upward mobility thus disregards how an empowered choice is actually rooted in local and environmental wisdom. Instead of focusing on how to increase the penetration of disposable sanitary napkins, we should now be looking for alternative solutions that are both environmentally sustainable and hygienic – solutions that do not involve penalising women for something they have no control over.